This type of video application is few and far between. Inexpensive, capable of creating beautiful 3D animations, and easy to use. And did I mention . . . inexpensive. 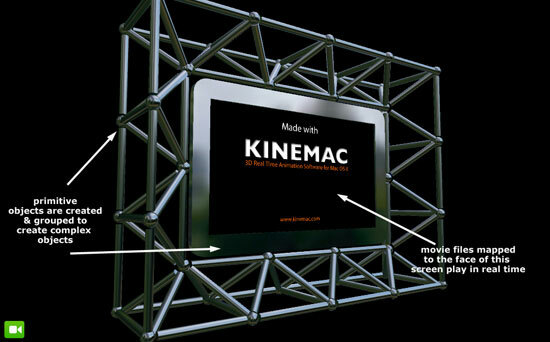 Kinemac 1.0 offers real-time 3D animation and presentation abilities using OpenGL acceleration and QuickTime support. Add drag-and-drop capabilities for scrolling and 3D text, images, movies, and audio, and you've got something special. But there's more. Its tools can create basic 3D objects such as cubes, cylinders, cones, pies, stars, and discs, all of which can be combined or "grouped" into complex shapes. Or import your own 3D models saved in "obj" format, and animate those objects. Basic shapes can be made to look like real life objects. Assign or "map" still images or movie files to each side of an object by dragging the file onto a "well" in the image inspector. For example, create a cube object. Rescale one side to create more of a box like look. 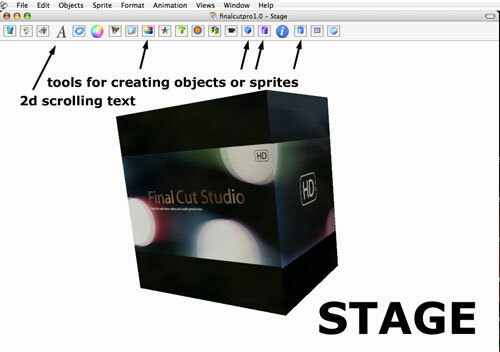 Then assemble your image maps by scanning or photographing the sides of the Final Cut Studio box into your computer. Image the front, back, top and sides, and assign each to the appropriate sides of the cube. You have now created 3D object that can be manipulated in real time in 3D space. The movie file can be outputted complete with alpha channel to your NLE. It also provides for 3D extruded and 2D scrolling text. 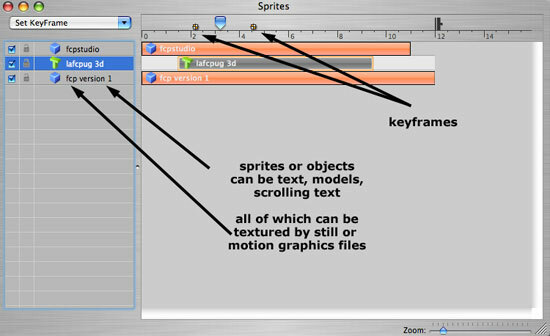 All of these objects (called sprites in Kinemac) can be key framed by position, size, depth, scale, and variety of other parameters. And the animation timing can be tweaked using Bezier curves. As I stated, Kinemac imports models saved in the ".obj" format, although currently only one texture per model can be assigned -- a deficiency that the company intends to address. I also had problems using more sophisticated obj files, which crashed the program. Illustrator files saved in the ".svg" format can be imported and extruded into shapes with depth. Any of these items can be animated. This permits you to create a company logo in Illustrator, and then bring it into Kinemac to be animated in real time. You can also drag music onto the stage to sequence the animation. You can use a locked down camera, or animate a camera by x, y, z coordinates or orientation. Camera animation combined with animated models, scrolling or 3D text, create sophisticated animations that can previewed in real time. I have yet to bog down the real time previews on my configuration, and the developer is working to increase real time speeds. Animation is achieved within a sprite timeline and the inspector. Key frames are set by position, size, rotation, and other parameters at a specific "point in time." The time indicator is moved to the second "point in time" and a key frame is added at the time to reflect the changed attributes. The program interpolates the change in properties and builds the "in between" frames. You can even key frame the fade in of any sprite. Further controls to refine movement, and pacing are provided using an animation control system based upon Bezier curves. Most of the work, however, resides in a tabbed inspector pane that controls what occurs on the stage. Individual tabs provide controls, among other things, for the size and background color of the stage, the geometry of any of the sprites (text, objects, scrolling text, etc. ), the textures or image/movie maps you apply to the sprites, 3D attributes such as the smoothness of an object, whether 2D text will remain static or scroll and how, lighting, camera, and an interesting scripting feature. This feature, among other capabilities, permits you to assign a script to an object to cause it to pause or loop between frames. As stated earlier the program can group a series of objects together to create more complex objects. In this way, you can create as simple or complex an animation as time and skill level permits. Export functions appear to be resolution independent, and will create alpha channels for compositing. I was able to quickly output to any QuickTime codec including HDV and DVCPRO50 and 100. This was achieved while working in a 1024x640 stage. My stock configuration is an ATIX800 and DP G5 2.5 GHz with 4 Gbs of RAM. My background is in Electric Image Animation Systems, a powerful, complex 3D animation package with film resolution capabilities. Many of you know how much the program cost ten years ago. 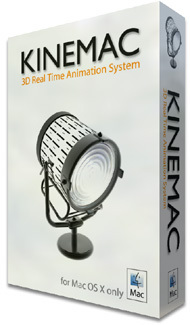 However, even in its current version, it does not approach the real time capabilities of Kinemac. In fairness, Kinemac does not currently have power or versatility of Electric Image. Kinemac has its quirks, as does any program in version one. Its support for multi faced obj files needs attention. Some interface controls present issues, none of which are substantial. Support is decent on line, but a few commands are hidden, or difficult to find. But the developer is committed to improving the application is receptive to suggestions. For the money, however, you simply won't be disappointed with this program.